K-O Brand Vintage Apple Crate Label. Original apple crate label from Karr Orchards, Yakima, Washington. Image of boxing glove clad hand punching left side of the label. K-O Brand Vintage Apple Crate Label. 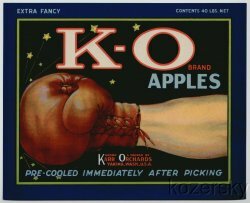 Original K-O Apple Crate Label, Karr Orchards, Yakima, Washington. This original, mint 1930s label measures 8x10 inches. Image of boxing glove clad hand punching left side of the label.